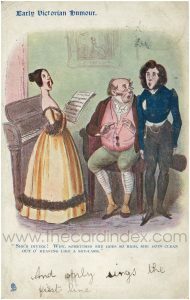 It’s amazing how much the social barometer of what is acceptable has changed. 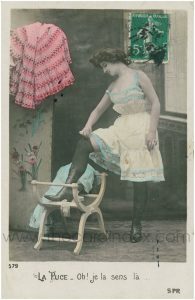 100 years ago this slightly cheeky postcard was considered highly risque. I love how playful it is and the colours are just fabulous. 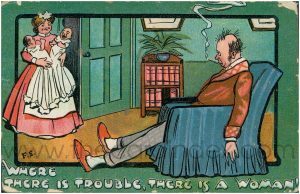 On World Voice Day, a postcard which could well be about me! On this day in 1912, the H.M.S Titanic, a British passenger liner sank in the North Atlantic Ocean in the early hours of the morning after it collided with an iceberg during its maiden voyage from Southampton to New York City. 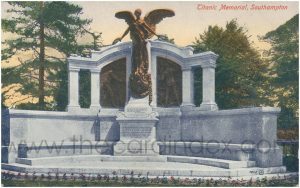 This memorial in Southampton was erected in honour of the engineers who died. 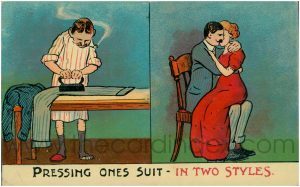 I rather love this postcard from around 1913 – I hate ironing so I know I’d much rather the latter! Happy Saturday! A rather apt card for today! On this day in 1877, The United Kingdom annexed the Transvaal, or South Africa as it is now known. 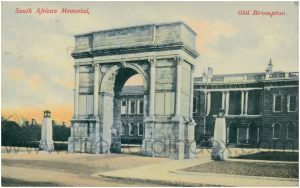 This is a postcard of the remarkable Memorial Arch in Chatham dedicated to the the Corps of the Royal Engineers and their comrades who lost their lives in the Boer War. Today is National Pet Day! 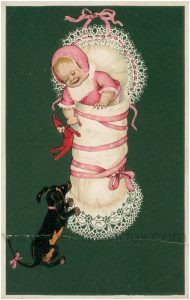 Rather love this old postcard of a newborn getting to know her pet dog! 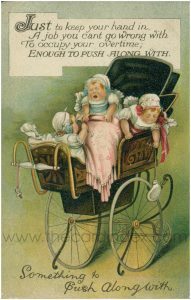 So many Edwardian postcards seem to be on the topic of childcare and crying babies! Here’s one perfect for National Siblings Day. Today (in 1806) marks the birth of English engineer and inventor Isambard Kingdom Brunel. 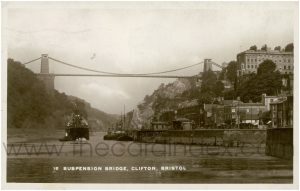 Perhaps the greatest of the 19th-century engineers, he’s probably best known for his designs for the Clifton Suspension Bridge in Bristol. I always feel so conflicted about zoos as I adore animals, but can’t help feel that they would be happier in their natural habitat. Some zoos are of course better than others. 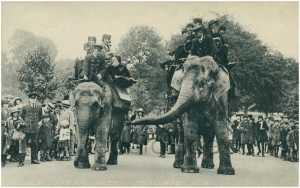 Although it’s elephant riding isn’t encouraged these days, here’s a striking postcard from London Zoo, circa 1920.